Researchers at the Kennedy Institute and Nuffield Department of Orthopaedics, Rheumatology, and Musculoskeletal Sciences, University of Oxford, working with clinicians at NHS Lothian, have found that injection of the anti-TNF drug adalimumab (Humira) into Dupuytren's disease nodules results in the reduction of the cell characteristics responsible for progression of Dupuytren's disease. Based on their laboratory data that tumor necrosis factor (TNF) drives the development of myofibroblasts, the cell type that causes Dupuytren's disease, the research team explored the effect of an anti-TNF drug injected directly into the Dupuytren's nodule tissue. The results so far are very promising. "Our data have shown that a concentrated formulation of adalimumab injected directly into the diseased tissue may be effective in targeting the cells responsible for Dupuytren's disease," said Jagdeep Nanchahal, MD, PhD, University of Oxford Professor of Hand, Plastic, and Reconstructive Surgery, who led the study. "This brings new hope to people who suffer from this disabling condition, who currently have to wait for their situation to be deteriorate, watching their hand lose function until it is bad enough for surgery. And then there's the lengthy recovery ahead, a less than ideal situation to find yourself in." 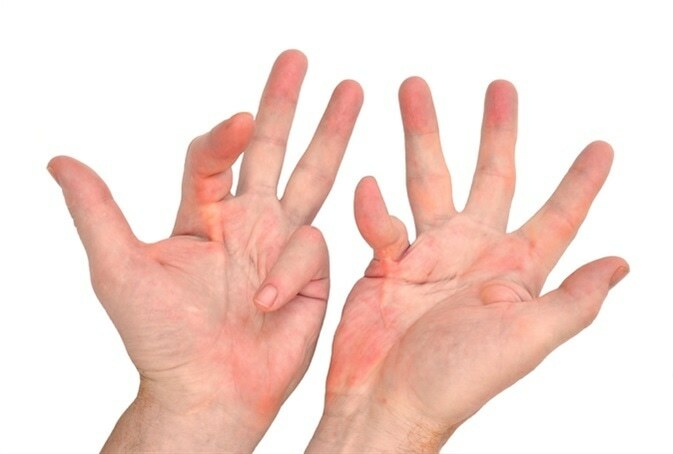 This randomized trial (phase 2a) recruited 28 patients with Dupuytren's disease who were scheduled to have surgery in Edinburgh to remove diseased tissue in their hand. Two weeks prior to surgery they received a single injection of varying doses of the anti-TNF drug, or placebo. The tissue removed during surgery, which is usually discarded, was then analyzed in the laboratory.